Firstly, let me apologise for the lack of What's On guides since Easter. Work and life have been busy, busy, busy and it took me longer than expected to get back into the swing of things after our holiday to Cuba. I'm back in the zone now though and there's lots of fun happening this weekend. Let me know if there's anything you fancy. Join Kirkley Hall in their quest to conserve the red squirrels in their grounds. You can build your own squirrel feeder (small additional charge) and join a keeper on a woodland walk where you'll learn to to spot signs of squirrels and maybe even a squirrel itself. There is no need to book. Find out more here. Expect ponies, tennis, golf, carnival rides, stocks, local food, stalls and kit flying in Richardson Dees Park this Saturday. Find out more here. There are two sessions available to pre-book - 11:30am - 1pm or 2pm - 3:30pm at the cost of £4 per child. The event is aimed at children aged 4+ and their families and is the chance for children to help a real inventor create new transport in the future. The workshop is designed to inspire minds both young and old. Find out more here. There are two free drop-in sessions at the Hancock Museum today (10:30am - 12:30pm and 1:30pm - 3:30pm). Designed for children aged 7+, there will be three additional activity stations in the Bones exhibition area. You will have the chance to build your own crazy creature out of paper bones, name your creature and think about it's diet and habitat before adding it to the project's online blog and finally match up some animal photographs with their skeletons. Find out more here. The FREE Miniature railway is running in Exhibition park this Sunday. Run by friendly volunteers, you'll find them just behind Wylam Brewery. Donations are welcome. 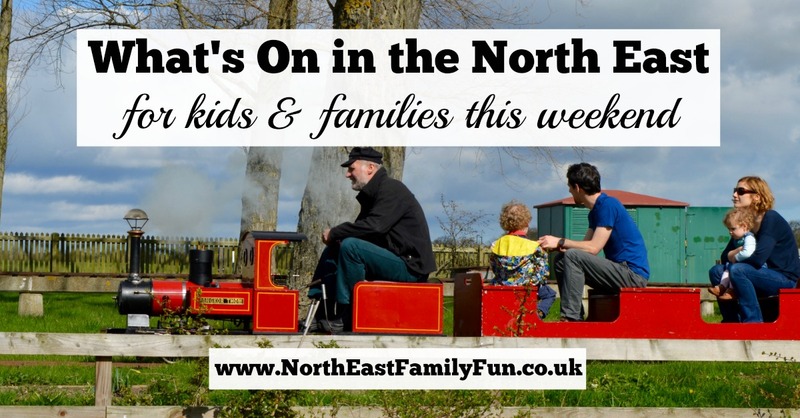 You can read about our trip on the railway, our time in Exhibition Park and Sunday lunch at Wylam Brewery last month here - both highly recommended. Find out more here. Your opportunity to make fan flowers. Included with regular admission. Find out more here. If you are a National Trust member and have yet to visit Cherryburn, now is your chance. Enjoy traditional folk music in the courtyard (hopefully the sun will shine). Included with regular admission. Find out more here. Bones at Great North Museum (review here) and Brick History at Life Science Centre (review here) both end on 14th May. If you haven't paid them a visit yet, they are both highly recommended and time is running out. Let me know what you're up to this weekend. H, H and J are heading to the coast with their grandparents on Saturday so Steve and I have booked to see Jason Isaacs at The Hilton. I can't wait!